Thursday September 18th 1890 We were busy with the work all forenoon and visited with Ida. The girls were over from town all afternoon and the children came over to go back with them. There was a hot wind from the south today and the dust was very bad. There was a rain with a strong wind about six oclock. It was six years today since Rob was buried. Friday September 19th 1890 It was cool today after the rain. We got our work all done up before noon and in the afternoon Mother got a buggy and Will took the team and took us to the valley. We stopped at Stevens, Nelsons and Aunt Ems. It was time to get supper when we come home. Will went to town in the evening. Saturday September 20th 1890 We got our baking and work done before noon. Will took Ida and Nellie over before noon. Mother and I walked over after. We got our work done up and went to the depot to see them start. Will brought me home in the buggy and Mother walked with Mollie Stevens and Mary Briggs. I had supper ready when the came. Will went to town in the evening. 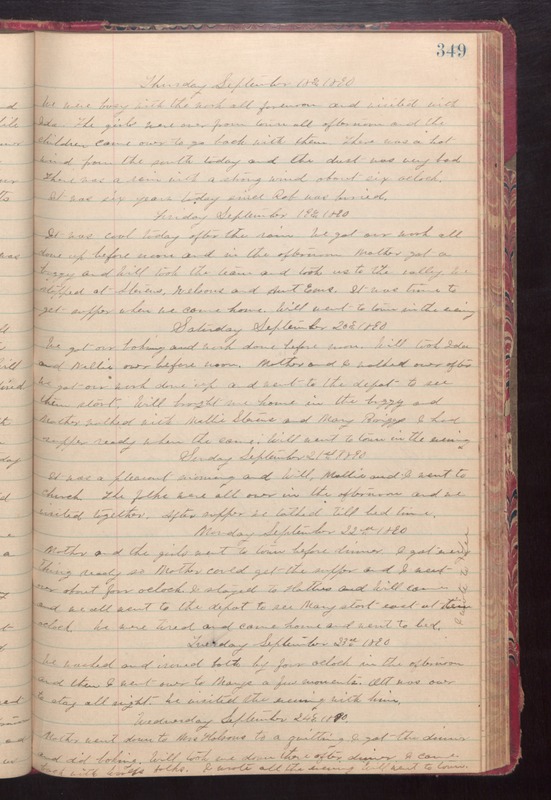 Sunday September 21st 1890 It was a pleasant morning and Will, Mollie and I went to church. The folks were all over in the afternoon and we visited together. After supper we talked till bed time. Monday Seoptember 22nd 1890 Mother and the girls went to town before dinner. I got every thing ready so Mother could get the supper and I went over about four oclock. I stayed to Hatties and Will came and we all went to the depot to see Mary start east at ten oclock. We were tired and came home and went to bed. [the following text is written vertically in the right margin of the above 3entry] I wrote to Lee. Tuesday September 23rd 1890 We washed and ironed both by four oclock in the afternoon and then I went over to Marys a few moments. Ott was over to stay all night. We visited the evening with him. Wednesday September 24th 1890 Mother went down to Mrs Holmes to a quilting. I got the dinner and did baking. Will took we down there after dinner. I came back with Woolfs folks. I wrote all the evening. Will went to town.